Industry. Not many people can claim that sort of pedigree. Denice, a Cinema Pioneer in her own right, also has a long association in the industry. Roger’s Grandfather William Harrison was an early “Picture Show Man”, who owned and operated a travelling picture show, The Goovigen Royal Talkies, near Gladstone for several years. In 1925, he opened the Empire Theatre at Caboolture. The last silent program, Universal’s “The Charlatan” and “The TipOff”, screened at the Empire on Saturday June 20, 1931. Tuesday 23 June 1931 saw the Grand Opening of The Empire Talkies featuring the ‘ALL TALKING’ Fox Movietone feature “The Black Watch”. The Empire’s original Kalee 7 ‘Indomitable’ plant had a new pedestal with the new Perfactus soundhead, from Butler Brothers in Brisbane. “The talkie plant has been brought right up to the standard of high fidelity by Mr A. G. Marshall who has studied all the latest designs of Talkies direct from America”. The same advertising material also proudly announced William as the 3rd prize winner of Paramount Week 1924 and the 1st prize winner of Paramount week 1935. ““When I was a Lad I went with my dad to the Pictures – Now I’m a Dad I’ll take my Lads to the Empire Pictures, where good Programmes, Courtesy and Civility are at your service”. The New Empire Theatre closed in 1949 and became a clothing factory. Following in the family tradition, Roger’s father Harold Harrison operated the Cremorne Theatre in Brisbane, and served in the Australian Army Amenities Corps as a projectionist running a mobile cinema in New Guinea. Roger could have done anything for a living, completing his secondary schooling at Church of England Boys Grammar, but chose to follow the footsteps of his father and his Grandfather into the Cinema Industry. Roger and Denice’s ‘Cinema partnership’ goes back a long way. Their first venture was in 1963, running the Tin Can Bay Cinema (on the coast outside Gympie). Roger’s father, Harold, painted the screen and Denice sold tickets and ran the Candy Bar. This was a quite successful operation with strong patronage from locals and the Australian Army personnel stationed in the area. the Air Force cadets. Roger went on to gain his pilot’s licence flying Tiger Moths out of Redclife Aero Club. Roger worked for two years (1958-1959) at Paramount Pictures as a film examiner. He secured the job as Assistant Projectionist at the Carlton Theatre in 1960 and was promoted to Projectionist in 1961 where he stayed until the theatre closed on 21 October 1971. Roger and Denice, in association with a couple of colleagues ran several of Brisbane’s suburban cinemas at one time or another, including Zillmere School of Arts, Salisbury, Darra, Caboolture “Rex” and the Maleny School of Arts. During this period Roger was invited by the then President Leo Erbetto to become a member of the Inner Circle of Motion Picture Projectionists (Queensland Branch). Roger was accepted as a member on 6 June 1965. Following the closure of the Carlton, Roger worked at several city cinemas including the SGIO Teatre, The Odeon and the Boondall and Aspley Drive-Ins in Brisbane. He installed the plant at the newly built Strathpine Drive-In and ran it for 17 years until it closed. He then returned to the Aspley Drive-in and was Manager/Operator there until it too closed on 23 February 2002. Throughout most of the Drive-in years Denice worked alongside Roger either in the ticket box, candy bar or managing the food preparation areas. When the owners (the Sourris family) went on an extended overseas holiday they provided Roger with a company vehicle and put Denice in charge of all food preparation activities including stock ordering and stock control. Roger and Denice also managed the Beenleigh Drive-In (later to become Yatala Drive-in) for some time until the Sourris family returned. Roger has a wealth of knowledge of the Cinema Industry and an encyclopaedic knowledge of Projection equipment. He pretty much knows which model projector head, which base, which soundhead and which model arcs are installed in cinemas across Queensland. He has been an avid collector of Projection equipment and has donated several pieces to the Queensland Museum. 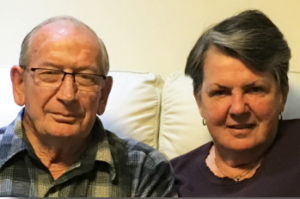 Roger and Denice together have had an involvement in the Queensland Cinema Industry that spans well over forty years.